Jonjo O'Neill was a relieved man after Holywell won at the Cheltenham Festival for the second successive year by running out the one and three quarter length winner of the Baylis & Harding Affordable Luxury Handicap Chase. The 10/1 shot was always travelling sweetly under jockey Richie McLernon and he took advantage of a mistake by the runner-up Ma Filleule at the third-last to draw alongside but his rider bided his time before pouncing after the last to storm up the hill. O'Neill, celebrating his 23rd Festival winner, had produced the winner to land the Pertemps Final at The Festival 12 months ago but preparations had not gone as smoothly as he had liked this time around and the trainer felt at one point that the seven-year-old had lost a little bit of interest in the game. "It's great for him to win here again but I thought that he was losing interest after his last victory at Doncaster to be honest," said O'Neill. "Nothing happened right for him there and we were thinking that the fences round here were big enough because he is not that big. "I only saw him miss one fence and Richie gave him a great spin. He gets on great with the horse. He only seems to ride him at Cheltenham so maybe that's the answer! "We all learnt a little bit from him last year, maybe to hang on to him a little bit longer but we did that at Doncaster and it didn't really work very well. "He slipped into a fence at Carlisle earlier on in the season which gave him a fright and it's taken him a while to come back from that and regain his confidence. 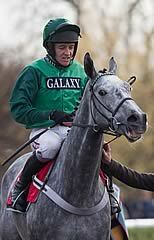 "A good gallop suits him down to the ground. Good horses can be terrible horses to ride in bad races - he has won here twice now and he is a good horse anyway. "I actually fell out with the handicapper after he gave him a mark of 145 recently but it looks like he was probably right!" A year after winning the Pertemps Network Final aboard Holywell, Richie McLernon was celebrating success on the same horse today. "This lad has a home for life with me. He is brilliant - he's honest, he jumps, he travels - I put him in some positions today and he got me out of them. 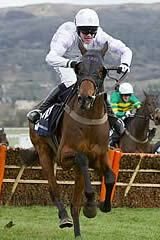 He was dynamite and well done to Mr O'Neill, the best trainer in England and Ireland," said McLernon. "He's a great trainer, absolutely brilliant - he is gifted. Cheltenham is what it is all about and he brought him here on the day. Well done to the team at home. Kate rides him out every day and I knew that he was spot on because she told me and she's not wrong that often. "Holywell likes it here - it's a good place for him to decide that he wants to go - and the crowd gees him up a bit as well. It's a pleasure to ride a horse like him." Conditional jockey Nico De Boinville will rarely have a bigger thrill in defeat than the one he enjoyed on 33/1 chance Ma Filleule. The six-year-old grey mare made a mistake at the third-last fence leaving De Boinville straining to regain a stirrup, but she was brilliant at the final fence and only surrendered a hard-won lead to Holywell on the run-in. De Boinville said of the Nicky Henderson-trained grey: "I'm disappointed, but she's run her heart out and was a lovely ride. I lost my iron coming down the hill and she was very genuine to run on again. Without a doubt, that's my best spin at The Festival." Third-placed The Package also ran well on his first start of the season, and trainer David Pipe confirmed his next target is the Crabbie's Grand National. Pipe said: "He's run a cracker and it's Grand National next stop. "He's been in really good form at home and I really fancied him to run well, but he's a little bit older and he was a little outpaced early on. He was caught a bit wide and came off the bridle a long way so credit to him for keeping going. "He's run in the National once before [in 2010] and was a bit sticky at the fences, but he was warming to the task when unseating [at the 19th fence]. As we know, it's a different race now." Trainer Lucinda Russell is eyeing the Hennessy Gold Cup at Newbury in November for fourth-placed Green Flag. She said: "I'm delighted with that - for a novice he's really stepped up to the mark. He would be much better on softer ground. "I'm not sure about immediate plans for him, but the Hennessy would be a nice race to aim for."